"Nobody has shown that better than Pope Francis, who I think has been transformative just through the sincerity and insistence that he's had that this is vital to who we are," President Barack Obama said during a panel discussion at Georgetown University. "And that emphasis I think is why he's had such incredible appeal, including to young people, all around the world." The three day Catholic-Evangelical leadership summit at Georgetown is a direct response to the pope's call to help the poor. It's been answered by an influential lineup of people on vastly different ends of the political spectrum. Speakers include ideological opposites from progressive Senator Cory Booker, a New Jersey Democrat and former conservative presidential candidate Tim Pawlenty to members of Opus Dei, a Roman Catholic lay organization, to Nuns On The Bus, a Catholic groups focused on social justice. 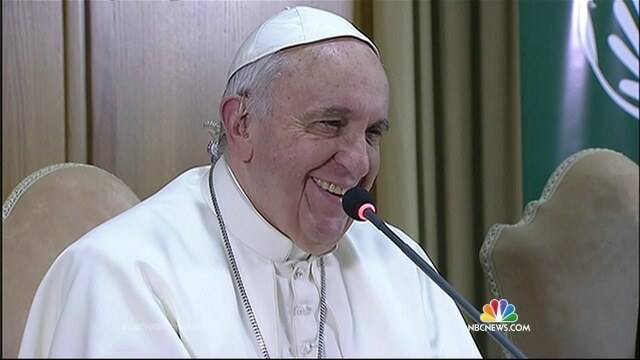 "It's been a long time since we've seen a pope have this kind of influence in the United States," said E.J. Dionne, Washington Post columnist who moderated the poverty panel including President Obama. However, it's too early to say whether Tuesday's talk will lead to change. "If they care about these problems, Americans can change the politics that would, over the next five to 10 years, make a huge difference. And I'm not talking about changing Republican-Democrat. I'm talking about making poverty and the opportunity to escape from poverty a higher issue on both parties' agendas," said Robert Putnam, the Peter and Isabel Malkin Professor of Public Policy at Harvard. Over the weekend Cuban President Raul Castro traveled to the Vatican to thank the pope for helping broker a breakthrough in U.S. Cuba relations. In September, Pope Francis comes to Washington and will visit the White House and be the first pope in history to address a joint session of Congress. Both House Speaker John Boehner and House Democratic Leader Nancy Pelosi are Catholics and there are 163 Catholics in Congress. While congressional approval ratings are in the teens, the pope's approval is 90 percent among U.S. Catholics. He'll try to wield that influence on issues like economic inequality, the environment and immigration. There's even a call for him to engage with religious leaders in the fight against ISIS. "I think the pope could play a huge significant role in this regard to galvanize support in the Muslim community to stand up against this perversion of their own faith," said Rep. Mike McCaul, a Texas Republican, and chairman of the Homeland Security committee. The president said he can't wait to host the pope and if he can spur the least effective congress in history to action, it might just be a certifiable miracle.